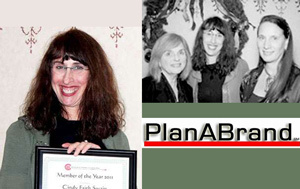 Cindy Faith Swain, whose company is PlanABrand, was honored as AWC SB’s 2011 Member of the Year. Her company is a full-service branding, marketing and social media company. Swain was honored for her contributions to advance the goals of AWC-SB and her leadership in the field of communications. Swain is a former board member of AWC SB. This entry was posted in Past Events on July 3, 2012 by awc sb.